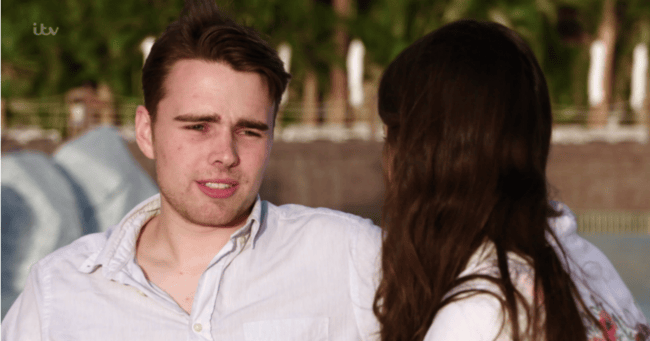 Take Me Out contestant has 'best first date ever' before sudden death. Charlie filmed his "best first date ever" for a TV show. Tragically, it would also be his last. Warning: This article deals with mental health and suicide. Tributes have been pouring in after a 22-year-old’s last date was aired on a UK TV show. Dating show, Take Me Out, dedicated an episode to contestant Charlie Watkins following his sudden death. The university student is understood to have taken his own life before the show was broadcast. The show’s host, Paddy McGuinness, said the episode was “in memory of Charlie”. The dating show aired the contestant’s trip to a tropical island with fellow contestant Jo Tara. After the pair went to a water park together, Jo Tara admitted having a crush on the 22-year-old and asked about a second date. “I wouldn’t understand why she fancied me, but I think she does,” he said on the show. The 22-year-old said it was “the best first date” he’d ever had. The pair got along well. Image via ITV. The scenes were aired with the permission of his family to raise awareness for mental health issues, according to The Daily Mail. A spokesman for the family previously told The Mail: "We have lost a very special young man who sadly never recovered from the tragic loss of his mother when he was only nine years old. "Tragically this is another example of the mental health issues suffered by young people today." Charlie on Take Me Out. Image via ITV. Some viewers were brought to tears after watching the show. One fan posted: "So sad seeing Charlie...knowing he isn&apos;t with us anymore. Mental health needs more support." Another said: "It&apos;s so important to talk if you don&apos;t feel right." Deffo shed a tear when take me out the gossip had the thing for Charlie at the end ???? Really sad to be watching Charlie on #takemeout knowing his life ended shortly afterwards ???? heart breaking for his family and friends ???? A fundraising page for the mental health charity Mind has been set up in his memory. To donate, click here.